After Godfried Schalcken Dutch "The Lady of Candlelight Luminescence"
After Antonis Sallaert (1594-1650) "Glorification of the Name of Jesus", oil on canvas in a period, if not original carved oak frame. Image 34.5" x 25.5" Frame 38" x 32" Antonis (or Antoon) Sallaert was born in Brussels in 1594. He became a master painter in 1613 and later served as dean of the painters' guild. He enjoyed a successful career not only as a painter, but as a print maker and tapestry designer. He received numerous commissions from the court and various religious orders, including the Jesuits, who commissioned "The Glorification of the Name of Jesus" circa 1635. The original painting, illustrated here, measures 79.5" x 54". Extrapolation reveals the offered work is a life-size copy, painted from the original. Although it appears to be a cut-down fragment, it is not. Notice the attendant on the right. His left hand and right shoulder are missing, replaced by billowing clouds. Examination of that area under UV light shows no sign of over-painting. Likewise for the other overlapping areas: there is no evidence of over-painting hear Christ's right hand and arm, nor around the cross and chalice. Given its size, the original painting almost certainly hung in a church, either as an altarpiece or in a chapel. Popular paintings were often copied, commissioned by wealthy parishioners for use as private devotionals in their homes. Such is doubtless the case here. While much smaller, the artist preserved the proportions and all essential elements: the cross and nails, the eucharistic chalice, the flail from the flagellation and the crown of thorns. Overall very good condition. Relined, with no significant repairs or restoration. 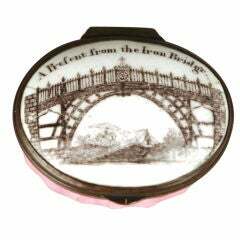 Enamel Patch Box "A Present from the Iron Bridge"
Enamel patch box, the top decorated with a transfer print, "A Present from the Iron Bridge," over the pink body and white base; opening to a mirrored lid. 17th century painting, of a scene just before the Crucifixion of Jesus H: 134cm W: 104cm. Antoni Tàpies (1923-2012) "Cavitat" Year 1982 Oil on paper Signed and reproduced in "Tapies Obra Completa" catalogue by Anna Agustí. Volume 5, page 84, number 4267.